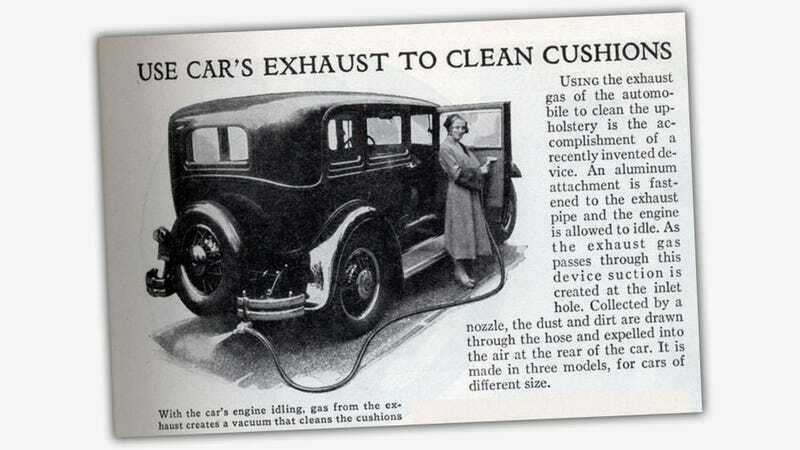 The headline of this February 1932 Popular Science article, "USE CAR EXHAUST TO CLEAN CUSHIONS" at first glance seems as sensible as "USE HUMAN FECES TO CLEAN TEETH," but when you really see what's going on, you'll accept it's not a terrible idea. Just a lousy one. The picture shows a long tube running from the exhaust, ending in a vacuum-cleaner-type attachment and an improbably pleased-looking woman holding it. You'd be forgiven for thinking this was a crude suicide device turned into a car-seat ruiner, since, well, that's what it looks like. But closer inspection shows a little valve assembly mounted on the tailpipe. And that's the key. The exhaust gases aren't being pumped through that hose and deep into the seats, but rather the exhaust is passed through the device to create suction, via Bernoulli's Principle. So what we have here actually is a vacuum cleaner, albeit an incredibly loud, expensive, and inefficient one. Is there anything cars can't do?